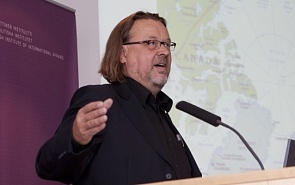 University Lecturer and Professor at Faculty of Social Sciences, University of Lapland, Finland. Among his other academic positions are Adjunct Professor at Frost Center for Canadian Studies, Trent University, Canada; Adjunct Professor at Faculty of Geography, University of Oulu, Finland; and Visiting Professor at University of Akureyri, Iceland. He is also the chairman of the International Steering Committee for the Northern Research Forum. Russia may be eager to develop strong armed forces in the Arctic, but its plans to modernize its strategic air force, to re-establish a strong navy, to modernize its fleet of strategic submarines, to build new icebreakers and replace old ones, to establish new FSS border control and SAR units, are a difficult task. It became trivial to say that climate change is the main reason and a trigger for the recent significant changes in the Arctic region. Indeed, climate change can exacerbate existing drivers of instability in the Arctic, and may lead to disputes over trade routes, maritime zones and resources previously inaccessible. The Third International Arctic Forum “The Arctic – Territory of Dialogue” organized by the Russian Geographical Society (RGS) will take place from 24st to 25th of September, 2013. The Forum will be held in Salekhard, the administrative center of Yamalo-Nenets Autonomous District and one of the two towns in the world located right on a Polar circle. New Russian Arctic Doctrine: From Idealism to Realism? Russia’s “readiness for war” is an essential part of the political discourse. Vladimir Putin, while giving a speech on a summary meeting of the Defense Ministry Board, put the situation in the Arctic region on a par with some of the “classic” threats to Russia's national security. More than 60 percent of Arctic oil and gas resources are deposited in areas which belong to or are claimed by the Russian Federation. It accounts for 375 billion barrels of oil. The general development of the hydrocarbon-driven economy in the Arctic must deal with energy security. It creates an ‘Arctic paradox’ whereby an increased utilization of off-shore hydrocarbons will contribute to climate change.